... but what the heck, we're on a roll -- moody, wordy Brits it is! Here's a really hard-to-find R&LT album from 1979. It was their least successful album, I think, not least due to the tongue-in-cheek-but-not-to-the-untrained-eye cover, parodying a real estate brochure, and the photo on the back of a leering Richard and Linda in medical smocks. Throw in some slabs of beef and baby dolls and you've got a "butcher cover" cover version. Another reason is its political message and fierce tone, in its overarching theme (and title song) mocking pre-fab middle-class domesticity, and, especially, in the daring militant anthem "Justice in the Streets," with its chanted chorus of "Allah, Allah". These days, putting the words "militant" and "Allah" in the same sentence carries unsavory implications, but this is a social-justice anthem, not a religious screed. Despite that abrasiveness, this is also one of the most studio-slick albums in the duo's catalog, a state-of-the-art recording for '79. It balances the sharp wit and sound of the above songs with some beautiful ballads, including Lonely Hearts and Sisters, the latter featuring the appropriately sisterly harmonies of Kate [R.I.P.] and Anna McGarrigle (as do two other songs here). Backing vox on other tracks come courtesy of Gerry Rafferty and Squeeze's Glenn Tillbrook. The backups on the aforementioned "Justice", meanwhile, are by two folks named Hafsa Abdul Jabbas and Abdu Rahim. This is a 320 rip of the 1992 cd on the Carthage label; it has not been reissued since, and I'm not holding my breath -- so here it is on The Rare Stuff! Neat post, thanks, looking forward to it, thanks! This was a favourite of mine all those years ago. I lost the vinyl and I'm not paying the exhorbitant prices that I've seen getting bandied about on the internet to get it on CD. So, to cut a long story short, thank you! Superb album, got the re-release on CD and worth every £. Now son Teddy is following in the family footsteps and carving out a musical career. 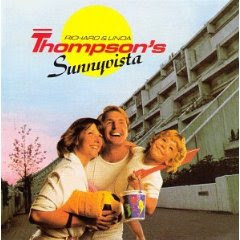 Every R & L Thompson album is worth getting, great writer and great singer of songs. I love this one. I'm surprised I dont see it more often. Thx.